Pooch portraits at Central Bark! Need an idea for a fail-proof holiday gift? Any dog who comes into Central Bark on Thursday, December 10, will have his or her photo taken, courtesy of Kathryn Sauber photography. Then when you come in to pick up your pooch, you can look at the proofs and purchase any you like. Please note that there’s no obligation to buy. If you’re a human who’d like to be in the photo with your pet, call us ahead of time at (206) 325-3525 to set up a specific time. Payment may be made in the form of cash or check. If Central Bark figures in your holiday plans, be sure you’ve made your reservation for boarding or grooming. Our available slots are filling fast, and we want to make sure you don’t miss out. Call now! Ah, the holidays. The decorations, the lights, and the music. And then there are the lovely greens that make everything so festive: Christmas Cactus, hemlock, holly, ivy, berries from mistletoe, poinsettias – all quite poisonous to pets. Here’s an idea. Pick the berries off the mistletoe, or wrap the whole plant in plastic to keep the berries from dropping. Put the plants and greenery in a room where the dog doesn’t go, or up (WAY up) out of reach. Or consider using artificial decorations instead. Many of them are quite realistic. When your dog looks at you with those big, soft eyes as you eat your holiday dinner, be strong! Cooked turkey, goose, chicken, and duck bones are extremely dangerous because they splinter and can get stuck or pierce a dog’s digestive tract. There’s even controversy about whether or not uncooked fowl is really safe for canines to eat, so talk to your vet if you want to try raw food with bones in it. This u-tube video has been seen almost 5 million times since it was first posted in December, 2007. It’s worth seeing again, for those of you who already saw it. And if you haven’t, get ready to be reminded why we love our pups so much. Pure joy! Sixty percent of people responding to our blog poll about services they want to see offered by Central Bark want training! If you haven’t voted yet, do! We want to know what services you think are important. Greet and meet the positive way! This week’s guest blogger, Ozzie, is a frequent visitor to Central Bark. Ozzie is a 9 year old cattle dog and we invited him to tell us a little bit about his experience and insights into the dog psyche. Greet and meet the positive way! By Ozzie Shwartz. Hi, my name is Ozzie. I am 9 years old, a cattle dog and I love to go to the park! I love to fetch the flying green balls and I love to meet new doggies and humans! Every time I see a dog I wag my tail; I get so excited I just have to bark in happiness because I can’t wait to play with them! When we meet, I sniff the other dog, the other dog sniffs me, then I send the universal doggie “come and play” gesture and off we go to have fun. When I meet humans I do the same. I wag my tail, I sometimes get too excited so I bark and then sniff, and if I want to play I bow, I pant some and hope they will join me in the game. If you ever meet me you’ll see that I love dogs and I love humans. My Mommy taught me from an early age that people, just like fellow dogs, are part of the pack and they are nice to have around. It’s always good too when your human teaches you at an early age about good manners around other dogs and humans. Not all dogs are as well conditioned to human presence as I am. Dogs, just like humans, have their own personality. Some are outgoing and confident, like me (I’m a bit of a show off too if you want the truth), but some are shy and nervous around other dogs and humans. Some dogs have had bad experiences from being strays on the streets or being abused so they’ve become timid and suspicious of any human contact. I know that because I meet them when I go for my walks and when I go to the park. These dogs just need a little extra care and attention so they can learn to trust again. I would like to feel that all dogs are friendly but I also understand that some dogs are not sure of my intentions, and I think it’s the same with humans meeting new dogs. Just like humans dogs use body language in order to communicate our emotions and intentions. Ears to the side, hackles up, trembling, glancing to the sides, growling, showing teeth are signals that we do not feel comfortable with intrusion to our personal space. When we are on a leash our personal space is even smaller and some of us can be unpredictable with humans we do not know. Best way to make friends with us doggies is first making sure to ask the dogs’ human if it’s OK to get close to their dog and if it’s OK to pet them; they should make it clear it is safe. If you know dogs, then you know we sniff everything and we know a lot about the world around us just by sniffing it. I love to sniff and when I meet and greet I would love to smell you if you let me! Crouch instead of stand, avoiding direct challenging eye contact, turn to the side instead of a frontal posture and let the dog smell you. All these moves will be talking the dogs’ language saying, “I don’t mean troubles.” These things are all important when getting close to a dog with a non confrontational body language, as described above, and will be easier on the dog. These moves are the best for making the dog feel OK with your presence. That’s what I do with new doggie friends I meet and also humans. Everyone loves a bit of attention and we dogs are no exception. Petting us however sometimes should be done with caution. Some of us have had bad experiences in the past and a hand reaching for us can appear threatening. If we have suffered at the hands of some less kind humans, then it’s better to skip the petting part until you’ve won our confidence. So instead of petting the dog’s head straight away, try petting the side of their body or chest… and only if the owner agrees to it. Any sudden movement can make a timid dog feels uncertain and unexpected as well. Meeting new dogs and humans is so much fun for me! I know greeting them in a positive way is the key to happy times together! Thanks for reading my blog and I hope to write more soon. And of course, thanks to Hertzi for translating. 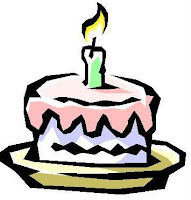 Central Bark is pleased to announce we’re partnering with a local bakery to provide birthday parties for your dog. If you’re interested, let us know, and we’ll put our noses together to figure out what makes your tail wag. …but first we want to know what YOU want. In the poll box on our blog, please vote for services you’d be interested in seeing us provide. You can make as many selections as you want. You get to help guide Central Bark’s future by telling us what’s important to you! As you make plans for the holidays, be sure you get your reservations in for doggie boarding and grooming at Central Bark. It’s a great convenience if you’re leaving town, or if your pooch needs a spruce-up for that holiday party. Overnight guests also get doggie daycare as part of the cost for boarding, so it’s a thrifty way to make your dollars stretch. Don’t wait until the last minute; it’s our busiest time of year! Greetings from Central Bark! This is our first-ever blog, “The Central Barker.” We want to provide you with relevant and useful information about the wonderful dogs in your life. What could be more appropriate than a discussion about the summer temperatures and the importance of caring for your furry friends in warmer weather? Your friends and neighbors at Central Bark would like to remind you about some ways to stay cool and safe. These simple precautions may save your animals’ lives. Every summer, hundreds of animals die needlessly due to hot and humid weather. Please, never leave a pet alone in a car. Even if the windows are open and it doesn’t seem that hot to you, the temperature inside a car can soar to over a hundred degrees in just a few minutes. Make sure your pets have access to plenty of fresh water and cool shade. If your dog loves water, get a kiddie pool. Don’t get the inflatable kind (for the obvious puncture hazard), but get the hard-sided plastic pools. They have an extra benefit: you can climb in yourself! Ice cream! Many pet stores are selling some sweet treats for dogs in the form of frozen treats. One brand is called SweetSpots, by Nature’s Variety. They’re (mostly) non-dairy, non-soy, non-corn. I know they are available at both All the Best and Mud Bay. You can also try making your own treats by freezing chicken or beef broth in ice cube trays. Bring your dog to Central Bark for a fun day of play in air-conditioned heaven! We have supervised play time, a wading pool, and off-leash park adventures. For an extra-special treat, schedule your pup for grooming. 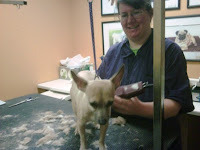 Our professional groomers will clip, brush, bathe, and pamper your dog. We even clip toenails – something a lot of pet owners dread. Remember to stay cool yourself. Drink plenty of fluids, and plan on fewer activities than usual during these extremely hot days.